Brandon WestphalRalph Williams, 2010 Steer Roping National Champion. Following a windy and chilly day Saturday, competitors and fans attending the first ever National Circuit Finals Steer Roping (NCFSR) in Torrington, Wyo., were treated to a beautiful day on Sunday with calm winds and a temperature near 70 degrees. 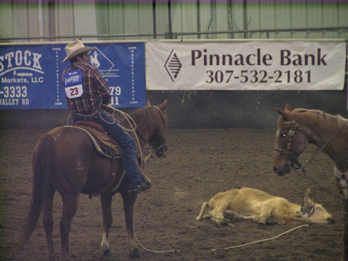 This year’s event, held in the Pavilion indoor arena at the Goshen County Fairgrounds, featured representatives from four of the Professional Rodeo Cowboys Association’s (PRCA) 12 regional circuits: Columbia River (Oregon, Washing ton), Mountain States (Colorado, Wyoming), Prairie (Kansas, Nebraska and Oklahoma), and Texas. Each competitor came to eastern Wyoming for the chance to win the rodeo and the title of 2010 Steer Roping National Champion. The tournament style format for the rodeo consisted of five preliminary rounds of competition followed by two “sudden death” rounds. The top eight contestants in the rodeo’s average at the end of regular competition advanced to the semifinal round where the slate was wiped clean and single round times determined placing. From the eight, the top four times advanced to the rodeo’s final “shoot out” round, where the slate was again wiped clean and the cowboy with the best time in the round was crowned champion. At the end of day one and the first three go-rounds, Oklahoma’s Cody Garnett held the lead in the average with a total time of 35.2 seconds on three head. The Prairie Circuit cowboy was followed by Rocket Freeman of Idaho, competing from the Columbia River Circuit. These were the only two cowboys to record times on three head during the early rounds of competition. Sunday’s competition included the final two rounds of regular competition, as well as the semifinal and final “shoot out” rounds. Garnett continued his momentum from day one and finished second in the average following round five. Freeman struggled on day two and slipped out of the top eight. Texas Circuit hand Vin Fisher Jr., of Amarillo, jumped from ninth place in the standings on Saturday to win first in the average on Sunday. A second place finish in round four followed by first place in round five gave him the win and qualification for the semifinals alongside Garnett. Also qualifying for the semifinal round were: Jim Ward (Columbia River Circuit), Will Gasperson (Texas Circuit), Ralph Williams (Prairie Circuit), Howdy McGinn (Columbia River Circuit), Chris Glover (Mountain States Circuit), and Buster Record Jr. (Prairie Circuit). A no time for Ward and times of 12.0 and 13.4 for Gasperson and Record Jr., narrowed the field to four and set the stage for the championship round. In the final round a McGinn miss and no time for Garnett made it a two man race for the title. In the end, it was Skiatook, Oklahoma’s Williams who posted an 11.9 run to win the last round and first National Champion title in the history of steer roping. Look for an interview with the new champion and other competitors from this year’s National Circuit Finals Steer Roping in future editions of the Fence Post.